Andrew Jackson spoke to Americans in ways that reflected the concerns of a young nation. Grover Cleveland helped citizens redefine themselves after the havoc of the Civil War era. FDR confronted widespread hardship with hope and determination, while Eisenhower spoke to our fears of the Communist menace. Throughout our history, presidents by their very utterances have shaped our sense of who we are as Americans. As Mary Stuckey observes, presidents embrace, articulate, and reinvigorate our sense of national identity. They define who Americans are—often by declaring who they aren’t. In this book, she shows how presidential speech has served to broaden the American political community over the past two centuries while at the same time excluding others. Ranging broadly from Andrew Jackson to Bill Clinton and George W. Bush, Stuckey demonstrates how presidents accomplish the dual enactment of inclusion and exclusion through their rhetorical and political choices. Our early leaders were preoccupied with balancing the growing nation; later presidents were concerned with the nature and definitions of citizenship. By examining the political speeches of presidents exemplifying distinctly different circumstances, she presents a series of snapshots which, when taken together, reveal both the continuity and the changes in our national self-understanding. Ambitious and sweeping, Stuckey’s work documents the tactics that have naturalized and legitimated inclusion and exclusion, tracing the progress of groups such as women and African Americans from political invisibility to partial visibility and eventual inclusion. She also shows how the terms of inclusion have varied with changing political winds, helping us understand how depictions of the powerless by the powerful reflect and influence the status of various groups. 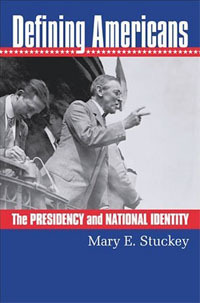 Stuckey’s analysis shows how presidents use language rooted in their times and circumstances to frame and influence contemporary definitions of citizenship. A provocative book that documents the changes in our understanding of who is and who isn’t one of “us,” Defining Americans reveals that all presidents draw upon the same set of national ideals, values, and events—but not all use those ideas in precisely the same ways. MARY E. STUCKEY is professor of communication and political science at Georgia State University and author of Strategic Failures in the Modern Presidency; The President as Interpreter-in-Chief; and Playing the Game: The Presidential Rhetoric of Ronald Reagan.